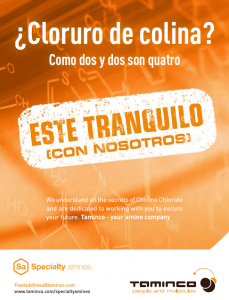 A carrier-free dry white choline chloride with free flowing properties for the production of animal feed. Taminco’s new feed additive Taminizer® C contains no less than 96% choline chloride and a maximum of 0.5% water after spray drying – a technique commonly used in human food production. Taminizer C increases productivity andthroughput by 2 to 4%* thanks to its high concentration of choline which creates room for additional ingredients/fillers. Taminizer C reduces quality control costby 1 to 2%* thanks to its pure and synthetic nature which eliminates the need for intensive/expensive analysis to check for the presence of undesired substances, such as aflatoxins, fungi spores, pesticide residues, GMO cobs, fishy odors,… . Taminizer C increases production capacity by 2 to 6%* thanks to its micro-granular structure and particle size, free flowing quality, and lump-free consistency, leading to an improved storage stability. The content of this website may be used only for informational purposes. This means that you can view, copy, print and distribute any document published by UkrFeed, given that the content is not for commercial use in connection with the distribution of documents reference is made to UkrFeed and all copyrights and other private information contained in content are reserved.